Because adrenal angiomyelolipoma (AAML) is rare and uniformly benign, the indications for surgery are ill defined. 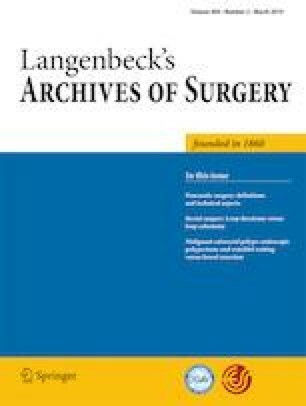 Among a series of 156 patients with adrenal pathologies surgically treated between 2013 and 2018, 12 patients were operated with the diagnosis of an AAML. The clinical as well as imaging parameters forming the individual indications for surgery were analyzed. Preoperative diagnosis consistent with AAML was made in all 12 patients. The mean size of surgically removed AAML was 82.3 mm (45–150 mm). Gender and affected side were evenly distributed. Local symptoms but lack of radiological signs suspicious for malignancy or size increase were observed in 4 of 12 patients (group 1, 33%). In contrast, 4 of 12 patients (group 2, 33%) showed radiological signs suspicious for malignancy but lacked local symptoms. Additional 4 of 12 patients (group 3, 33%) showed both local symptoms and radiological signs suspicious for malignancy. Patients with local symptoms harbored significantly larger tumors compared to those patients that lacked local symptoms (93.9 mm ± 32.8 vs. 59.3 mm ± 2.7, p = 0.021). Patients with radiologically suspicious signs were older (60 years ± 9.9 vs. 53 years ± 5.4, p > 0.05), and time to surgery was shorter (4.4 months ± 3 vs. 6.0 months ± 3.0, p > 0.05). Importantly, surgical approach was not influenced by tumor size (p = 0.65). However, patients with suspicious imaging were more likely to be operated by conventional open approach (4 of 8 vs. 0 of 4, p = 0.08). The minimal invasive approach was associated with shorter hospital stay (7 days, ± 1.3 vs. 14.2 days, ± 8.8, p = 0.038). All lesions that showed radiological signs suspicious for malignancy proved benign in final histology. Large AAML present a clinical challenge. The presence of local symptoms and/or radiological signs suspicious for malignancy identifies three groups of patients that define the concept of an individualized indication for surgery in AAML. A minimal invasive approach can be advocated even for large AAML with radiological signs suspicious for malignancy. All procedures performed in studies involving human participants were in accordance with the ethical standards of the institutional committee (votum of the ethics committee Medical Faculty, University Duisburg-Essen: No.19-8597-BO) and with the 1964 Helsinki declaration and its later amendments or comparable ethical standards.